Today on Three Times A Charm we meet the brother/sister writing team, David Fraser & Heather Brainerd. I love introducing my readers to the people who work in children’s publishing. Glad you could join us, guys. Can you tell us a little about yourselves, please? Heather's Bio: I live in New York with my photographer husband, our three sons, and a crazy pug-terrier. When I’m not writing, I like to read, go for walks with my dog, and work out while watching the show Bones. I also run a Disney blog, and spend a lot of time daydreaming about my next trip to Disney World…or maybe we should go to Disneyland…or maybe a Disney cruise. Okay, so I’m kind of Disney-obsessed. Dave's Bio: I also live in New York, but three hours away from Heather. This is probably for the best. I'm most tolerable in small doses. I have a wife and two daughters, who surprisingly choose to live with me and not three hours away. Oh, and we have a dog, too. He's a Yorkie-mutt who really enjoys barking at one in the morning at animals that may or may not be out in our yard. I'm coaching youth soccer this summer. We're the orange team. Last but not least, my optometrist said that I'm going to need bifocals in the near future. Bifocals – the hazard of being an author. Or maybe simply the ravages of age. Sigh. So, I’m completely intrigued by the fact that you guys are siblings and a writing team. My kids get along great, but I can’t see them doing something creatively collaborative together and still getting along great in the end. Tell us about your latest book, please. Having tackled the realms of paranormal mystery (the José Picada, PI series) and YA paranormal romance (Dream Shade, written by Heather; Dave is allergic to romance), Shadows of New York is our first venture into the land of Middle Grade. What started as a simple tale about a boy and his werewolf male nanny took over our lives until we became ensconced in the Imaginary World. We hope you like it there as much as we do! Eleven-year-old Josh Cooper is surprised when his new nanny ends up being a dude, but that pales in comparison to how he feels when he learns the nanny, Aiden, is also a werewolf. Aiden teaches Josh about the Imaginary World, even introducing him to his friends Larry Fancypants (a suave-yet-goofy vampire) and Steve Lickerman (a tall-yet-meek leprechaun). 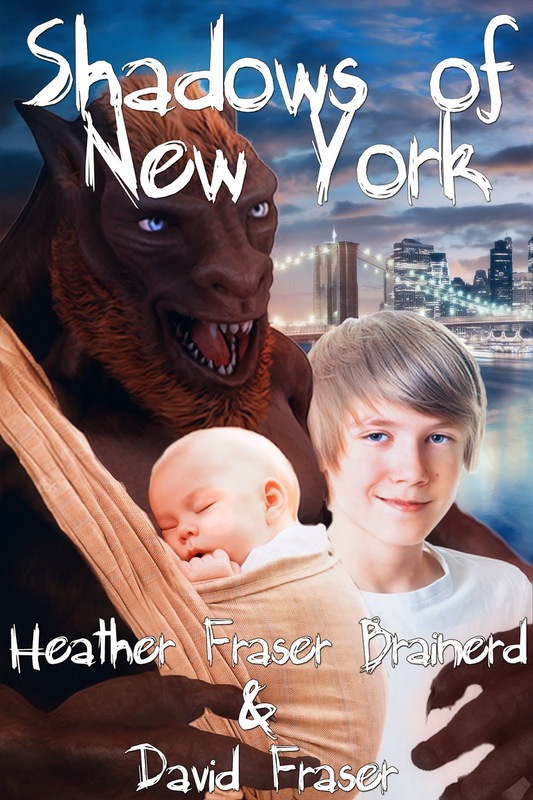 This fascinating world seems harmless, until Josh learns of the shadowy wraith that’s stalking New York, attacking creatures and stealing their powers. As werewolves are ideally suited for fighting wraiths, Aiden is called upon to help capture the elusive Mr. Midnight, unintentionally drawing Josh even deeper into the strange and mysterious. You can meet the adorable brother and sister team, Josh & Rosemary Cooper from Shadows of New York in the Building Character interview from last month. Now it’s time for the three’s. Please share you top three answers to the following questions so we can get to know you a little better. Proper use of punctuation, bo staff combat, and sweet dance moves. It's important to be well-rounded. Thrift-shopping for medical scrubs, pig racing, and practicing aforementioned sweet dance moves. And finally, where can our tech savvy readers find more about you so they don’t miss out on your books? Thanks for joining us on this week’s Three Times A Charm, and for providing our day’s laughter. Best of luck to you both and to Shadows of New York. Congrats on entering the world of middle grade! Thanks for hosting us, Kai! We love visiting your blog! You guys are so much fun. You're welcome anytime. Fun interview, but I think Mother Teresa stole that quote from Socrates. Will this change the sainthood thing? Let's give her the benefit of the doubt. Really, the important thing is that you vote for Pedro. Thanks for stopping by, Anne and Ken! Thanks for visiting Ken and Anne.